We met eight years ago through mutual friends at a not-so-romantic location, the Queensbridge Hotel in Melbourne. We were good friends for a year or so before Nick finally asked me out on a date and the rest is history! When we realised that we weren’t just boyfriend and girlfriend, but BEST friends. We have very similar personality types and the same strange sense of humour. We couldn’t imagine life without each other. 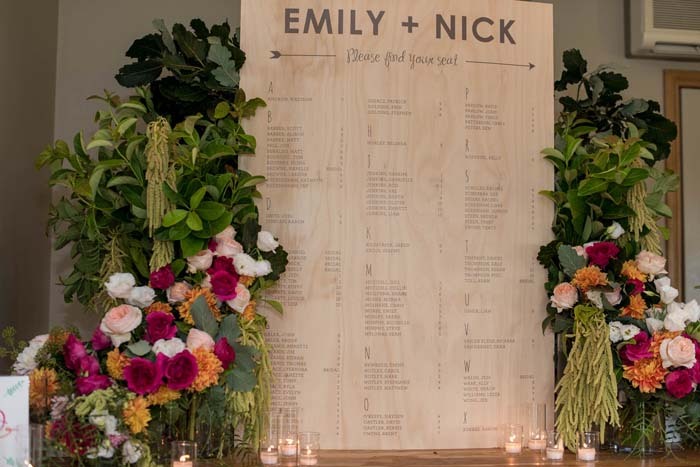 A winery wedding with lots of colours, bright flowers, greenery, pendant lights and timber furniture. The ceremony was held in front of the vineyard at Glen Erin at Lancefield under a magnificent archway covered in bright, colourful flowers. The reception was also celebrated at Glen Erin at Lancefield. My wedding gown was designed by the wonderful Mario & Ines at Crocé & Colosimo. It was a couture gown individually designed with beautiful Italian silk organza and delicately beaded French lace. Mario & Ines created my gown exactly as I imagined it and I cannot thank them enough. It is now safely stored away in a preservation box from Syndal’s Bridal Dry Cleaners after they hand cleaned it. It looks the same as the day I picked it up from Crocé & Colosimo and I look forward to showing our future children some day. 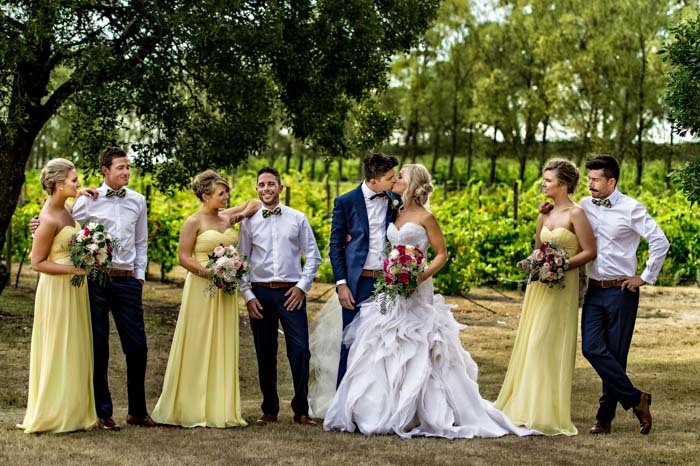 Full length pastel yellow dresses with sweetheart necklines. Made from delicate soft chiffon. The groomsmen wore blue pants, white shirts, brown belts, brown leather shoes and bow ties in blue and yellow to coordinate with the bridesmaids. We wanted bright and colourful. Tim from The Style Co. was our florist and certainly did not disappoint. 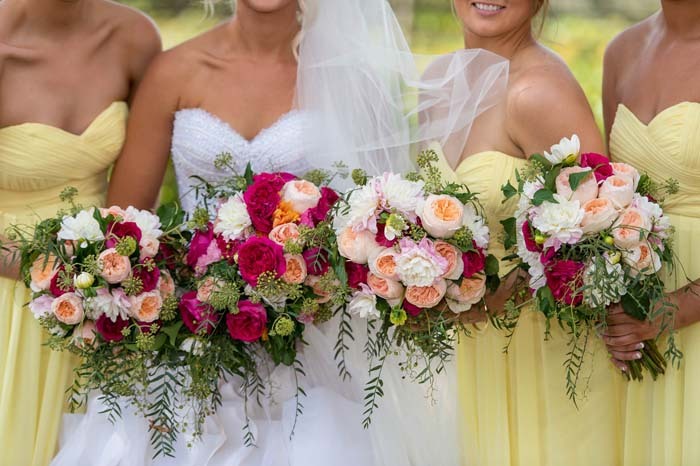 The flowers were everything we imagined + more! The team at The Style Co. styled the reception venue. They covered the ceiling thick with oak foliage, ivy and ferns and drop lighting, transforming the space to create an indoor forest feel. 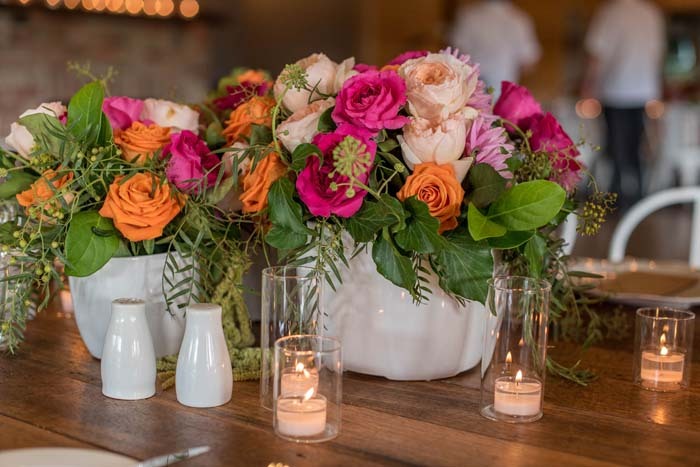 There were lots of beautiful bright flowers on the timber tables, mesh tolix chairs, tea light candles and individual menus placed on white charger plates. It was truly magical! We chose Oastler images as we had seen David’s work numerous times and were always amazed at the images he produced. After meeting him and his wife Kerrie (who is also his assistant) we knew they were the photographers for our wedding. David and Kerrie are so friendly and made us feel extremely comfortable during our photos, especially Nick who does not like to be photographed. The photographs from our wedding are amazing and we are so happy to have chosen Oastler Images. We love how natural the photos look. We couldn't be happier with our wedding photos and video. David was able to capture the feelings and emotions of our day and we will treasure them for many years to come. The most memorable moment for me was seeing Nick’s smiling, but nervous face as I walked down the aisle. I felt a surge of relief as I finally reached him at the end. He instantly calmed my nerves and I felt so lucky to be marrying him. Koh Samui, Thailand. We spent 2 weeks at the beautiful SALA Samui Resort and Spa. Our days were filled with lots of eating, swimming and sunbaking. It was very relaxing and we can’t wait to go back there one day. We are living in our house we built back in 2011 and are now starting another house build. Busy times ahead! We plan to have our house finished by the end of the year and then start planning a family. Photography Oastler Images Ceremony + Reception Venue Glen Erin at Lancefield Bride's Dress Crocé & Colosimo Couture Wedding Flowers + Styling The Style Co.